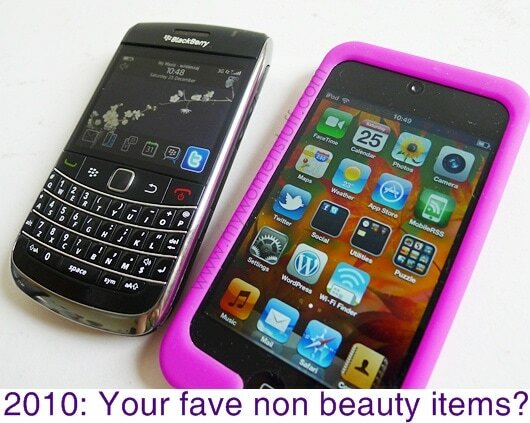 Home » Musings » What is your favourite non-beauty item in 2010? What is your favourite non-beauty item in 2010? There was so much to love about all the beautiful beauty related things we saw in 2010. But I’m curious if you have a favourite non-beauty item in 2010? As for the iPod Touch, I’m glad I waited for the 4th Generation version because I love Facetime! I use it to chat to my sister who is living overseas for now whenever she’s on wifi with her iPhone. Or else, there’s Skype. The drawback to the iPod Touch of course is that I need a wifi connection to be connected to the internet. Music features on it, but I use my iPod mostly for other things like surfing on the go (the large screen is much easier to view than the smaller Blackberry screen) and for what I’d like to call “time wasting”. This means my addiction to this game app called iJewels 😛 Now I own the iPod I’m very glad I didn’t go the way of the iPhone. The touch screen drives me mad 😛 Oh and much as I enjoy using WordPress on the iPod Touch, it drives me mad how it crashes all the time on me. I don’t know if its just me though. NEXT POST: Eyeko Cherry Fat Balm : Who are you calling Fat then? Definitely my Sony ereader. I’m shopping from home today, looking for cheap (or free) ebooks! I like that I can buy lots (and easily hide my purchases) and have a continual library to read. Ebooks also are cheaper and there’s a lot of deals and discounts going around. Definitely my blackberry too! Smartest purchase ever! Mine has to be my HTC HD2 coz it supports both Windows (for Garmin), and Android! Yeay for angry birds! Hmmm…it would be the roasting pan 🙂 I’ve always wanted to get a good roasting pan ala Jamie and when I got it, I was over the moon..hehehe! And I was also over the moon and Venus when I got a cutlery set from a friend…woohooooo! That would be my Marc by Marc Jacobs Classic Q Hillier Hobo and Classic Q Groovee Satchel. I bought those two around June and I just can’t get enough of MbMJ bags, that I’m thinking of collecting most of them. Haha… they’ll burn a lovely big hole in your wallet! 😉 I haven’t got anything by Marc by Marc Jacobs yet. Are the bags heavy? I passed on so many Marc Jacobs bags because they weigh a ton without anything in them and I just couldn’t handle the weight with all my junk in there! Me lurve me new Ipad from hubby 🙂 angry bird…woohoo!! My new MacBookPro–woot! My last mac was literally falling apart on me! Teehee… so many gadgets! I love that 😀 And a Miu Miu! Delicious! Haha now you got me tempted to give it a go, but shipping is killer so will wait till I mosey my way Down Under 😉 For me, Lady Dior is pretty much a show bag. Not something I’d be able to tote around. Not with all the junk I carry everyday 😛 But like you, if its going to be a gift… heck! Who’d say no to that?! Yes~ I am still waiting for DH to get me a bag, because I don’t want to spend my own money. And it doesn’t look like I will ever get a Lady Dior lol. My Netbook and Sony PSP! Yay *high 5 Mr AMW* Now tell me, how does he watch cartoons on his iPod? Inquiring minds want to know! BTW didn’t you get the Samsung Galaxy? Or am I terribly behind on things? Lol! Hey that actually sounds like a lot of fun, especially if you travel around often 😀 And its a gadget! We all look like gadget geeks now lol! It has got to be my LV Speedy 25 Azur! It might not be the biggest bag around, but I love the fact that I can stuff most of my things inside it. It’s just so practical (for me) and I’m just so in love with it. Now I’m thinking of getting another Speedy in Ebene.. Am I mad? Haha. My iPhone and several good reads. Good reads! Do you have a fave? I’m enjoying Elizabeth Gilbert’s Eat Pray Love; Thich Nhat Hanh’s True Love; Ajahn Brahm’s Opening The Door Of Your Heart etc. I do read several books at one go depending on my mood. Haha.